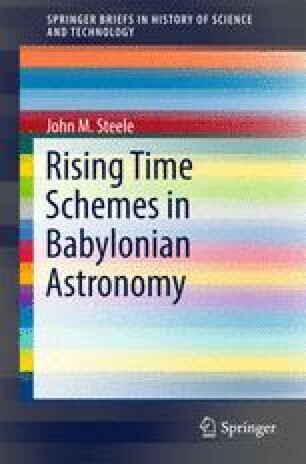 This chapter presents a previously unknown form of rising time scheme which is founded upon the calendar. Three cuneiform texts whose contents were not previously understood are shown to contain a rising time scheme which relates culminating points at or behind ziqpu stars with sunrise and sunset on day 15 of months in the schematic 360-day calendar. The underlying rising time scheme is fully reconstructed and shown to be founded on the assumption from MUL.APIN that the solstices and equinoxes take place on the 15th day of Months I, IV, VII and X in the schematic calendar. Finally, a previously misunderstood text is shown to contain an extension of the monthly scheme to give the culminating points at sunrise and sunset on every day of the schematic year.